In accordance with the General Assembly resolution A/RES/66/253 of 16 February and following close consultations between Secretary-General Ban Ki-Moon and the Secretary-General of the League of Arab States Nabil ElAraby, the two today announced the appointment of former United Nations Secretary-General Kofi Annan as the Joint Special Envoy of the United Nations and the League of Arab States on the Syrian crisis. 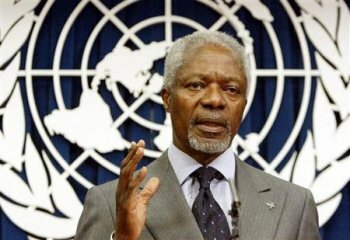 The Secretaries-General are grateful to Mr. Annan for accepting this important mission at a critical time for the people of Syria. A deputy for the Joint Special Envoy will be chosen from the Arab region. The Special Envoy will be the high-level representative of the Secretaries-General of the United Nations and the League of Arab States on the Syrian crisis. The Special Envoy will provide good offices aimed at bringing an end to all violence and human rights violations, and promoting a peaceful solution to the Syrian crisis. The Special Envoy will be guided in this endeavour by the provisions of the General Assembly resolution A/RES/66/253 and the relevant resolutions of the League of Arab States. He will consult broadly and engage with all relevant interlocutors within and outside Syria in order to end the violence and the humanitarian crisis, and facilitate a peaceful Syrian-led and inclusive political solution that meets the democratic aspirations of the Syrian people through a comprehensive political dialogue between the Syrian government and the whole spectrum of the Syrian opposition.